What really did it were my wedding pictures. On what was supposed to be the happiest day of my life, my gut was enormous, and it showed. And when had I picked up that extra chin? Of course, I didn't see myself that way. In my head, I was still the skinny kid I was in college. But those pictures, which began to show up in my inbox almost as soon as the ceremony was over, said otherwise. So, without much fanfare (mainly because I doubted my own 'stick-to-it-iveness'), I started to focus on getting healthier. Which, of course, meant dropping the extra weight and getting stronger. I cut the snacks & sugary drinks from my diet. I started to run. And I dusted off the weights in the garage and began to use them. Also, given my own bookish nature, I began to read up on fitness. When The First 20 Minutes came out near the beginning of this year, I dutifully gobbled it up. But I must have been in a workout-induced fog, because it wasn't until a couple of months later, when I read the book again, that its revelations really sank in. 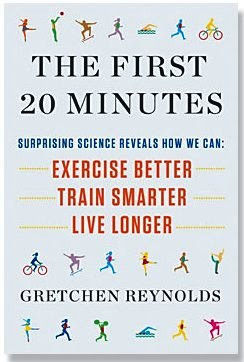 Written by New York Times writer Gretchen Reynolds, The First 20 Minutes offers a comprehensive tour of the current state of fitness & health research, ranging across a variety of disciplines, and the book's conclusions were, for me, revelatory. Inactivity is as deadly as tobacco use. Stretching is overrated, but superstitions aren't. Vitamins & supplements can do more damage than good. The more you exercise, the smarter you get. Chocolate milk is a better recovery drink than Gatorade. Arranged in neat chapters, each of which is concluded with a nice, numbered encapsulation that offers practical advice on how to implement its lessons into your life, The First 20 Minutes is a book that I cannot recommend enough. Since reading it and integrating its insights into my own daily routine, I have greatly increased the efficiency & effectiveness of my exercise routines, doing more good in less time. If any of you know what a Tabata or a Fartlek is, then you'll know what it is I do every day. The result: I've lost 65 pounds since the beginning of this year and my energy levels and moods have never been better. I'm not saying The First 20 Minutes was instrumental in my weight-loss & improved health. I am saying that reading this book gave me the intellectual ammunition to stay the course. In other words, it's a book that helped me keep talking myself into working out. Do yourself a favor: Read this book, and then get up, get moving, and keep moving. Some cops come into the shop for coffee, and they hang out for a while. As they leave, I say, "Stay cool out there," at which one of the cops stops and says, "You know, the thing is, people know it's gonna be hot, but they still lose their minds!" "I had to respond to a call yesterday where this woman's car overheated and died," he continued. 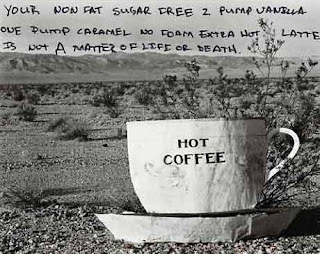 "I get there and get her car over to the side of the road, and she says, 'Did you bring me some water? I told the operator to make sure you bring some.' I go, 'No, ma'am, but there's a store right over there.' Then she asks me to take a look at her car to see what's wrong with it. I tell her I'm a cop, not a mechanic! That's why they gave me this (pointing to his weapon), not a wrench. Then she goes, 'You're not very helpful! Why do they even have 911 service!' So I had to tell her, 'Ma'am, I'm here to help you with emergencies and make sure you're safe, not repair your vehicle or provide you with snacks. 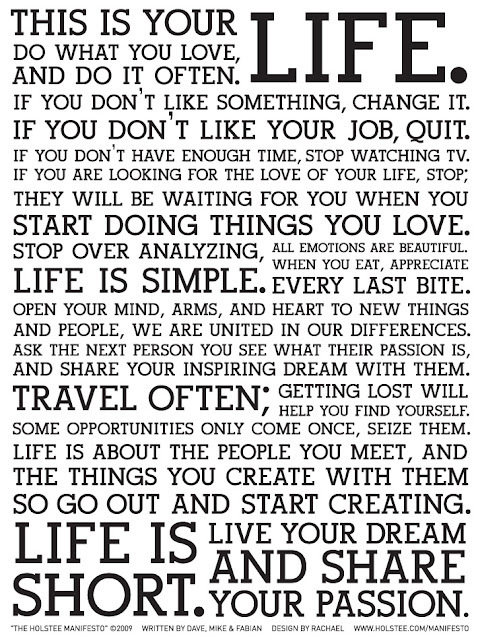 Have a nice day.'" Below is a video of the presentation that Frank Warren, the founder of the PostSecret project, gave at TED. Frank is an example of someone whose crazy idea basically blew up in his face and turned into a cottage industry that benefits not only himself & his family but does countless good for others, if only to bring people together in a way that fosters sympathy and communal feeling. I believe in the PostSecret project. I visit the website every week. It's the kind of thing that encourages connections between strangers. In that way, it is, I feel, sacred. And fun. So last night I had this dream that I was throwing a housewarming party after moving into this giant mansion. The place really was gigantic and kind of mazelike, with many levels surrounded by a big expanse of land that was walled-off into little gardens. I don't know what I did to get the money to buy it, but it seemed like the mansion was on some kind of ridgetop overlooking a city and the ocean. Maybe it was Los Angeles. Maybe it was no place on Earth. Anyway, I'm just walking around the grounds of my new home. There are white-smocked caterers everywhere, tending to long tables festooned with food & drink, as well as black-suited security guards wearing dark glasses & talking into their sleeves like Secret Service agents. There are even a couple of stages where some bands are doing sound-checks. 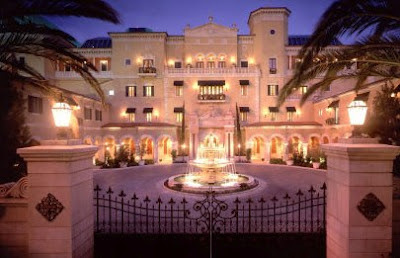 I'm dressed very casually, in jeans and a white long-sleeved shirt & comfortable shoes, and as the sun starts to set, I find myself at the front door of the mansion, standing and waving as limos pull up the long driveway, circle around a big fountain, and stop to let their passengers out onto a red carpet that leads inside. The people getting out of the limos are all dressed very formally, in tuxedos and long gowns, which makes me very self-conscious, and they're everyone I know. Old friends, members of my family, people I used to work with and people I work with now -- they're all there, including acquaintances and people whose names I can't remember but whose faces I kind of recognize. And they all just kind of wave at me without saying anything before heading into the party, making me feel kind of foolish. But somehow it feels like it's my job to welcome everyone, so I stay until the last guest has arrived and the last limo has pulled away. By then, it's well after dark, and I can hear the party going full-bore from where I stand out front. There's music and laughter and the buzz of excited conversation. And so I enter my own house to join my own party. I start saying hello to my many guests as I move through the crush of people, and, at first, whoever I talk to responds politely, with a quick nod or a wink or that thing guys do with their eyebrows and a little jerk of their heads. But as I get further into the mansion, something changes, and people stop noticing me. I say hello, and it's like they don't even hear me, even though we're standing right next to each other. It's not that I'm invisible or anything like that. I can reach out and touch people, and when I do, they acknowledge my presence. But then they just go back to whatever conversation or activity they were previously engaged in. And suddenly I'm too self-conscious to assert myself. It's like I'm afraid to interrupt my guests, even though it's my party. And so I find myself outside the mansion, wandering the grounds like before, only this time every garden is packed with partiers and I just weave my way through them like a ghost. The only people who speak to me are the staff -- waiters who say, "Sir?" and offer me a glass of champagne or an hors d'oeuvre, or a security guard who nods at me and asks, "Sir, is everything alright?" I just wave them all off and keep wandering. I pass through a gate into the large garden that is farthest from my mansion. It's a big meadow, bigger than a football field, and the near end has a bandstand where a swing orchestra is playing in front a crowd of dancing, swaying couples. Right next to the bandstand, on another raised platform, is a giant, round banquet table where my entire family is sitting -- my parents, my wife, all of my siblings and cousins and aunts and uncles. I make my way onto this platform, and I realize that they're all engaged in the same conversation, with everyone telling some family story that everyone knows so that each person contributes a sentence or two. And I feel like I should know this story, with the way everyone is laughing and nodding and participating. But I don't, because I can't understand a word anyone is saying. It's not that they're speaking in a foreign language; it's more like the music is so loud that I can't really follow what's being said, even though everyone else can. They're even laughing at punchlines in unison as the narration moves from person to person. And, of course, no one even acknowledges me when I come up. They're too engaged in getting their story told. This is when I notice, at the far end of the meadow, a helipad, complete with a helicopter on it. So I hop off the platform, make my way through the throngs of dancing couples, and head over to the gleaming helicopter that I know must surely be mine. As I step onto the helipad, one of the black-suited security guards nods at me and opens the side-door of the helicopter. As I crawl in and take a seat, the pilot powers up the machine. The side-door gets closed and latched, and as I look out the window at the lights and movements of my housewarming party, the helicopter begins to lift off the ground. Straight up we go, and I look down at my lit-up estate as we rise. I can see all of it -- the sprawling mansion, the terraced grounds, the frenetic crowd of partygoers -- getting smaller and smaller beneath me as the helicopter gains altitude. "Where to, sir?" the helmeted pilot asks. I turn away from the window. "Take me out over the ocean," I tell him. "I think I'd like to be alone for a while." Almost everyone loves chocolate, and almost everyone loves caramel. But when you put them together? There are very few people who can resist this powerfully decadent combo of flavors. Super-sweet and super-cold, this is the perfect way to beat the heat this summer! 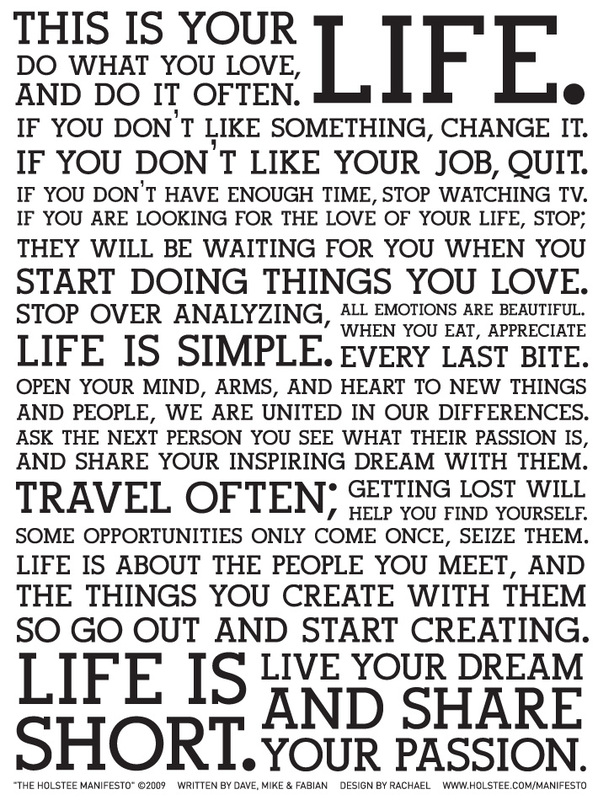 As manifestos go, this one ain't half bad. Visit their site & buy the poster. 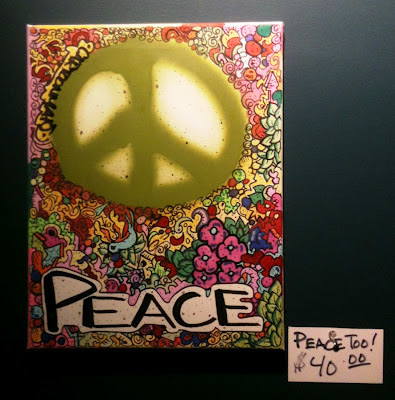 Local artist Tommy Vinci has hung another piece in Grouchy John's Coffee Shop! It's entitled "Peace Too!" and features the same whimsical energy & bright colors that characterize all of Tommy's work. This 11" by 14" work isn't a print; it's ink-and-paint on canvas, a unique original. Come on down, get some caffeinated happiness, and check out "Peace Too!" as well as other work by Tommy Vinci, including his popular minis for only $10. Tommy makes frequent visits to our shop, so, who knows, you might even get to meet the artist himself!